Marketing, Strategic communications, Business Development, Public Relations, Social media, Etc. According to Encyclopedia Britannica, public diplomacy, or people’s diplomacy, is any of various government-sponsored efforts aimed at communicating directly with foreign publics. The soft power: Communicate, dialogue, Persuade and convince, in this approach the target audiences take part by their conviction (perception-based management). This entry was posted in PR, public affairs, public diplomacy, reputation. The Social CRM is using social media services, techniques and technologies to enable organizations to engage with their customers (SCRM, But, also the CRM software industries like Microsoft, SAP SE, Salesforce.com, Sage Group, Splendid CRM, Sugar CRM, Zoho Office Suite and others are integrating their software with social media platforms in order to realize Social CRM activities. Do you think in this situation that exists a voice of customers (Social CRM) versus a voice of industries (CRM Social)? This entry was posted in marketing, PR, reputation, Social Media. One day I went to our quarter’s supermarket to buy something and when arrived there I have remarked that the seller was unhappy! – Are you well (said I)? – Our today’s customers are no longer okay anymore (replied she)! – Do you mean that we are no good at all (interrogated I)? – I don’t mean you, I mean the rest of customers (corrected she)! – So yourself included (specified I)? – No! … The customers I said (insisted she)! – Yes, but you are one of them (persisted I)! Because you are buying and consuming every day as well as all those you are calling customers are doing (clarified I)! This entry was posted in Business development, marketing and tagged Custumer, Sales. The ‘4 Models’ of public relations practice: How far have you evolved? 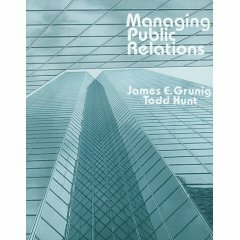 While preparing to teach my first PR class back in ’85, I happened upon “Managing Public Relations,” by Jim Grunig and Todd Hunt. Though I lost track of my copy long ago (never loan textbooks to students — never), one element of that book influenced how I taught and practiced PR for the past 23 years. Grunig & Hunt’s “4 Models” of public relations practice went on to became the most talked-about theory in the discipline. The “4 Models” describe distinct approaches to public relations in the context of a 130-year timeline that shows how public relations has evolved. In the process, Grunig & Hunt identify an “ideal” approach to public relations — something they call the 2-way symmetrical model — and place it at the top of the evolutionary pyramid. The 10 Rules You Need to Communicate Effectively… That’s really perfect. Frank Luntz has “engineered some of the most potent political and corporate campaigns of the last decade.” His wordsmithing helped Republican Rudy Giuliani get elected twice in New York — a city where Democrats outnumber Republicans 5-to-1. Luntz and his polling firm have learned a great deal about language by conducting nearly 1500 surveys and focus groups for a wide range of products and politicians. It’s another part of crisis communication’s plan, the online proactive plan. When bad news or an emergency suddenly strikes an organization, its website is ordinarily the first place the outside world turns to for information. Given the extreme time pressure inherent in crisis management today, there is just no time to construct a new crisis site from scratch. Instead, a prebuilt dark site can be quickly “turned on” as needed during a crisis management situation. 2008 was a really interesting year for me, professionally, as I was exposed to a tonne of new stuff including online crisis communications. As a result, I wrote the following briefing note for existing and potential clients which I am delighted to share with you. I can in no means call this my own work as with all pieces that go to clients, this was proofed and improved on by another team member – in this case the inimitable Brandy Fleming. It’s on something that is becoming increasingly important from a communications and crisis preparedness perspective: dark sites. What is a “dark site”? A dark site is a pre-developed, non-public Web site that can be published to the live Web in the event of a crisis. Why develop a dark site? Fast Company Names Top 10 Robotics Innovators? The Generality of Strategic Communication Management (SCM). Does it Matter if You Are Black or White?